In 2019 there is another amazing trip abroad planned! This year we’ll be visiting the lovely capital of Portugal, Lisbon. It is going to be a fantastic trip that you don’t want to miss! During the trip a variety of nice activities are arranged. We are visiting two interesting companies and a university. We will also discover Lisbon itself by day and night, during a lovely city tour, a pub crawl and many more fun activities. Do you want to be present at the best activity of the year? Don’t wait any longer and sign up to experience all the craziness and coziness from the trip to Lisbon! Departure: You are expected on May 8th at Groningen CS at 10:30AM we will take the train to Schiphol from there. 1. You must be aware of internal rules and the behavior protocol. Like at all the activities of Commotie, the bylaws of Commotie and the internal regulations of Commotie also apply to the trip abroad. You can find these at the page with all the documents. Furthermore, we would like to point out the Behavioral protocol for multi day activities. You can find this document here. This document is a protocol that serves for the safety and health of the participants of a certain multiday activity and to make clear what is permitted and what is not. Also the costs are stated that arise from misbehavior, these costs can be recovered by the causer. By signing up you agree with the formulated rules and guidelines that can be found in these documents. 2. You need to apply on this page. This application is obligatory. 3.If you have signed up via the website, you will receive an email with the link to the last step: a form that includes all data we need from you so we can book the flight tickets. 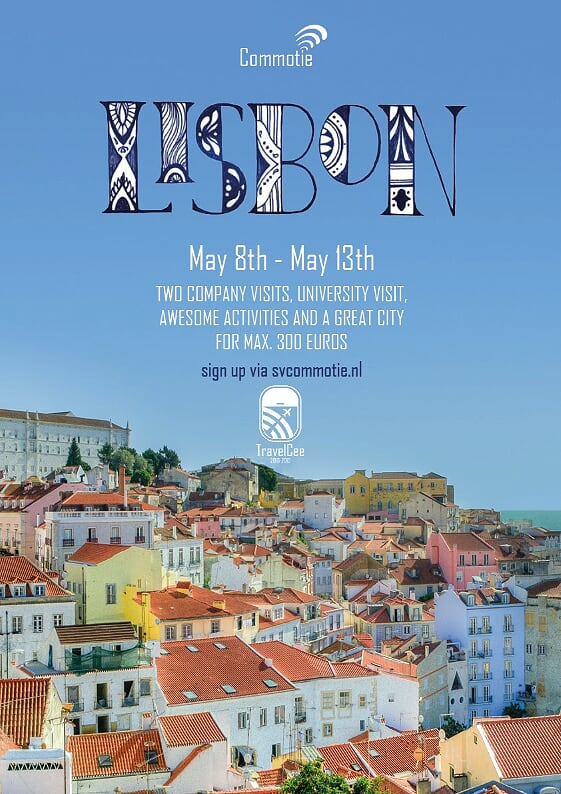 4.Say to the TravelCee bot ‘’I am going to Lisbon!’’ and sign up for the bot’s passengers list. You will receive all the information you need before and during the trip from the bot! We strongly recommend applying for cancellation insurance. Unsubscribing for the trip abroad is not possible. Replacement can be arranged until January 15th.